Socio-cognitive engineering is a framework for the systematic design of socio-technical systems (people and their interaction with technology), based on the study and analysis of how people think, learn, perceive, work, and interact. The framework has been applied to the design of a broad range of human-centered technologies, including a Writer’s Assistant (Sharples, Goodlet, & Pemberton, 1992), a training system for neuroradiologists (Sharples et al., 2000), and a mobile learning device for children (Sharples, Corlett, & Westmancott, 2002). It has been adopted by the European MOBIlearn project (www.mobilearn. org) to develop mobile technology for learning. 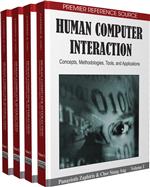 It also has been taught to undergraduate and postgraduate students to guide their interactive systems projects. An overview of the framework can be found in Sharples et al. (2002).